We can safely prune or limb your trees or completely remove them. One of the most often asked questions is: "How much does it cost to cut down a tree?" Since every tree is unique it is a very difficult question to answer accurately until I have seen the tree and its surroundings. Estimates are always free! Cutting a tree down in the middle of a field is very different from one that is growing over the roof of your house or near power lines. Obstacles and structures all must be considered so that no one is hurt and property is not damaged by the work. Time and technical difficulties of the work determine the price. We pride ourselves on being very price competitive while offering top quality work. Some trees are good candidates for cutting right at the stump. Others must be dismantled one branch at a time, and sometimes those branches have to be lowered down on ropes to protect structures directly below. In our area most of our clients have trees in their backyards that are inaccessible to bucket trucks or even cranes. These trees have really become our specialty. 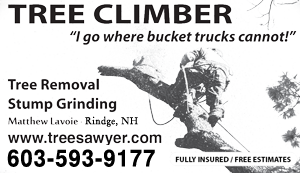 To limb or remove trees without using a bucket truck usually requires that those trees be climbed - a special skill. 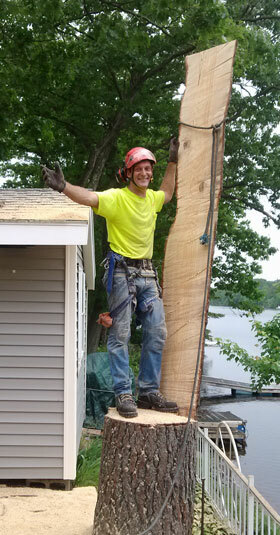 Using all OSHA approved equipment, we climb into the trees to perform the needed work. When this is done near the street there will often be cars pulled over to watch. It is an age-old art that is still needed. Fortunately the modernized ropes and harnesses have increased the safety factor for the climber dramatically. Take a moment to view some of our exciting photos and videos! Some trees are simply unsafe to climb. Removing dead or hazardous trees which cannot be climbed forces us to bring out the bucket lift. There are times when this is the fastest and safest way to work. Whenever evaluating a work project, we will tell you if the bucket truck is a better option than climbing. Why does a dead tree need special recognition? Dead standing trees, called snags, are a favorite hangout for wildlife but they are particulary dangerous if they are anywhere near your home. Trees hold a tremendous amount of weight up at trecherous heights. Compared to a healthy living tree which has a living outer shell and intact central skeleton for strength, the dead tree loses its elasticity as it dries out. Insects begin to infiltrate the tree early and this accelerates the rotting process. Eventually the structure cannot hold up its own enormous weight and collapses, breaks over, or uproots. Many people have been killed or badly injured from falling trees or even branches. They fall silently sometimes and without much warning. During hurricanes or high winds reported deaths are most often caused by falling trees. Do yourself a huge favor and have any dead or dying trees near your home professionally removed. Cutting down a dead tree also requires a deep understanding of what can reliably be expected by the cutting. Many tree tops have broken over and killed or injured sawyers attempting to fell these hazards.